Brooklyn Nine-Nine just wrapped its fifth season, so what’s next? Recently, co-creator Dan Goor spoke with Deadline about the TV show’s future on NBC. As reported earlier, NBC picked up the cop comedy for a sixth season after FOX cancelled it. The cast includes Andy Samberg, Andre Braugher, Terry Crews, Melissa Fumero, Joe Lo Truglio, Stephanie Beatriz, Chelsea Peretti, Joel McKinnon Miller, and Dirk Blocker. What do you think? Are you a fan of Brooklyn Nine-Nine? Are you looking forward to the new season on NBC? 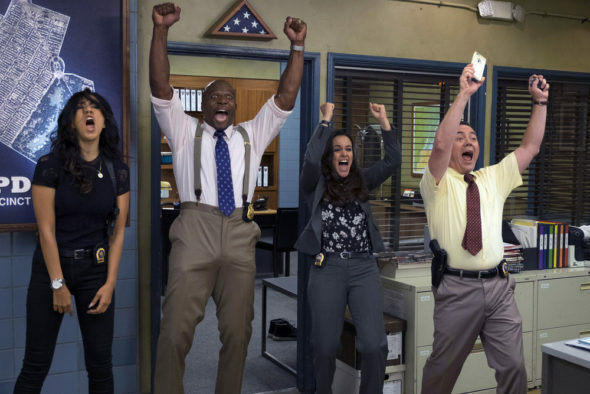 More about: Brooklyn Nine-Nine, Brooklyn Nine-Nine: canceled or renewed?, FOX TV shows: canceled or renewed?, NBC TV shows: canceled or renewed? Omg yes on Lin-Manuel Miranda!! !